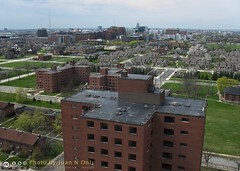 After eating and shopping in Detroit's Eastern Market, I drove by the old, abandoned ruins of the Brewster-Douglass Housing Projects on the opposite side of the freeway, eying it up for doing my Kite Aerial Photography (KAP). I circled around the complex, then parked and waited, looking for signs of activity that might indicate trouble. Once satisfied, I got out my gear, trudged across the uneven ground towards the remaining high-rise towers of the complex and started setting up my Rokkaku kite. While doing so, a couple of men with tools entered one of the towers and a little later, after my kite was in the air, I heard pounding as they were removing materials for scavenging. I kept glancing over to that tower to see if they would come out and approach me, however, I think scavengers want to keep as low a profile as possible. The damp, uneven ground meant that I had to be careful of my footing as I moved around. The ground seemed like a few hundred vehicles had driven around on it while it was soft and, over the years, that has probably been the case. There was also a wet, muddy area I had to avoid when bringing down my rig and kite. Trees down-wind from me threatened to snag my kite and my KAP rig, but I managed to avoid them. This was my longest single KAP session to date at over an hour of air time. I wasn't getting the altitude I wanted at first, so I brought the kite down, adjusted the bridle tow-point and sent it and the KAP rig back up. It worked, I got more lift from the kite, got the rig up higher and most of the shots that I have posted to Flickr were taken after the adjustment. This also was probably my riskiest KAP in terms of the chance to get mugged, being in a rather isolated, derelict area. The freeway service drive that runs past there gets little traffic. KAPping in such circumstances is somewhat scary because you're a sitting duck when you have a kite in the air. My Sony NEX-5 hasn't come back from repairs yet, so I'm still using my Canon A630 on a CHDK intervalometer in a hybrid auto-KAP rig using the Gentles clickPAN-IR ("peanut") for my NEX-5 to rotate it and with the tilt angle fixed. Click here to view my set of photos from that day at Flickr.com. Or click here to browse the set of photos on a black background here at JuanNOnly.com. Cool photos!I've also staterd doing some KAP around Brisbane recently.We built a Delta Conyne (9 foot), and I made a self-rotating rig with a little Jaycar 3v geared motor and using a Canon P&S camera. Hopefully try some shots up the Sunshine Coast tomorrow.